RePub, Erasmus University Repository: Does cultural capital contribute to educational inequalities in food consumption in the Netherlands? 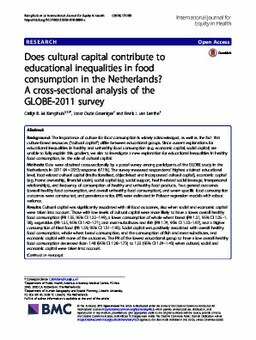 Does cultural capital contribute to educational inequalities in food consumption in the Netherlands? BACKGROUND: The importance of culture for food consumption is widely acknowledged, as well as the fact that culture-based resources ("cultural capital") differ between educational groups. Since current explanations for educational inequalities in healthy and unhealthy food consumption (e.g. economic capital, social capital) are unable to fully explain this gradient, we aim to investigate a new explanation for educational inequalities in healthy food consumption, i.e. the role of cultural capital. METHODS: Data were obtained cross-sectionally by a postal survey among participants of the GLOBE study in the Netherlands in 2011 (N = 2953; response 67.1%). The survey measured respondents' highest attained educational level, food-related cultural capital (institutionalised, objectivised and incorporated cultural capital), economic capital (e.g. home ownership, financial strain), social capital (e.g. social support, health-related social leverage, interpersonal relationships), and frequency of consumption of healthy and unhealthy food products. Two general outcomes (overall healthy food consumption, and overall unhealthy food consumption), and seven specific food consumption outcomes were constructed, and prevalence ratios (PR) were estimated in Poisson regression models with robust variance. RESULTS: Cultural capital was significantly associated with all food outcomes, also when social and economic capital were taken into account. Those with low levels of cultural capital were more likely to have a lower overall healthy food consumption (PR 1.35, 95% CI 1.22-1.49), a lower consumption of whole wheat bread (PR 1.21, 95% CI 1.05-1.38), vegetables (PR 1.55, 95% CI 1.40-1.71), and meat-substitutes and fish (PR 1.74, 95% CI 1.53-1.97), and a higher consumption of fried food (PR 1.59, 95% CI 1.31-1.93). Social capital was positively associated with overall healthy food consumption, whole wheat bread consumption, and the consumption of fish and meat-substitutes, and economic capital with none of the outcomes. The PR of the lowest educational group to have a low overall healthy food consumption decreased from 1.48 (95% CI 1.28-1.73) to 1.22 (95% CI 1.04-1.43) when cultural, social and economic capital were taken into account. CONCLUSIONS: Cultural capital contributed to the explanation of educational inequalities in food consumption in The Netherlands, over and above economic and social capital. The socialisation processes through which cultural capital is acquired could offer new entry-points for the promotion of healthy food consumption among low educational groups.